The M-480 is the first V-Mixer to support a cascade connection that enables 96 channels of mixing by connecting a second unit - all via one simple Cat5e/6 cable. Supporting live events, mobile production, broadcasting, and sound installation the V-Mixing System with the M-480 V-Mixer at its heart provides a premium level of innovation for any live mixing venue. The M-480 is the flagship of the V-Mixer lineup which includes the M-300 and the M-200i. To find out more about how each model compares see the V-Mixer Comparison Chart. Add the powerful and comprehensive iPad app to control the M-480 V-Mixer. Available on the iTunes AppStore. The processing power of the M-480 supports the widest range of venues and applications. The newly developed mixing engine provides a 4-band fully parametric EQ, gate, compressor, and delay on each input channel. 214 possible patch points with 90 discreet outputs. In large format venues such as a concert halls and stadiums as well in broadcast applications, audio time alignment settings are critical. The M-480 is equipped with delays on all mixing channels and outputs buses. High quality and precise sound adjustments can be accomplished by using the built-in real time analyzer. The M-480 supports a cascade connection requested by many live sound engineers. Connecting two M-480s with one REAC cable enables the mixing of up to 96 channels as well as advanced synchronization of internal buses. A mixing environment equivalent to a large format console can be created within a minimal footprint and budget. The capacity of 48 mixing channels, 6 stereo returns, main LCR outputs, 16 AUX buses, and 8 matrices supports any venue or application. The fully assignable REAC A and B patchbays allows for very flexible internal routing. A post preamp patchpoint allows direct routing from inputs to outputs without having to route through the console. The M-480 is equipped with six dual-mono, multi-effects processors that are available as AUX or insert effects. Each multi-effects processor has 18 algorithms of various types such as reverb, delay, chorus, pitch shift and advanced channel strip. Six types of precisely emulated legendary vintage Roland effects such as the RE-201, SDE-3000, and SRV-2000 are included. In addition, twelve 31-band graphic EQs or 8-band fully parametric EQs are included for sound adjustment. The six multi-effects and twelve GEQs/PEQs can be used simultaneously for a total of 24 GEQs if needed. The M-480 supports live multi-channel recording. Simply connect the R-1000 with Cat5e/6 cables to easily record (or playback) up to 48 channels of 24 bit audio. Uncompressed BWF file data is stored on a removable SSD or HDD where it can be edited later in the studio with a DAW of choice. By using Cakewalk SONAR Producer software*, up to 40 channels can be recorded directly by simply connecting a single REAC cable to a PC. In addition, the built-in USB memory recorder can record a stereo output signal from the M-480 as an uncompressed WAV file. The USB memory recorder also supports WAV file playback for convenient playback of music and announcements. * REAC driver kit is required to record using Cakewalk SONAR directly. For the performing musician wanting the best possible sound quality and ﬂexibility in their individual stage mix, the M-48 Live Personal Mixer offers control over 40 audio sources that can be easily managed in 16 assignable stereo groups. 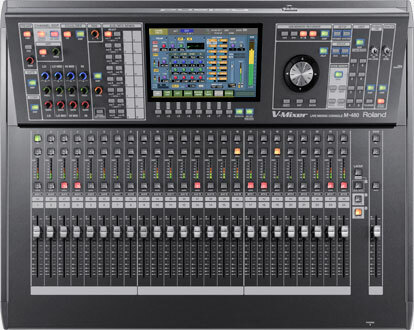 Conﬁgurations are straightforward with the ability to control, save and recall all connected M-48s from an M-480, M-400, M-380 or M-300 V-Mixer allowing the FOH engineer to assist in setup and mixing. The use of IEMs (In-Ear Monitors) dramatically reduces the amount of sound picked up by stage microphones. It also eliminates feedback while providing superb sound quality for both live performance and recording. M-400/480 Labeling Template Use this PDF label template to print labels for your M-400 or M-480 unit onto standard 8.5"x11" sticker or magnetic laser/inkjetpaper. One page contains enough for one unit. The backbone of the V-Mixing System is based on REAC – Roland's Ethernet Audio Communication transmission protocol for low latency, high quality digital audio transfer. Products using REAC technology are installed today in many venues and have been used for high profile events worldwide. REAC's 24-bit, 40x40 channel protocol delivers pristine digital audio via lightweight, inexpensive and easy to install cable (Cat5e/6). REAC technology is immune to externally induced signal quality degradation or hums and buzzes typically found in analog systems. You have more freedom in cable placement resulting in lower cost and better sounding. Learn more about the power and benefits of REAC. See Pre-Configured V-Mixing Systems ready to go here.